I am a potatoholic. 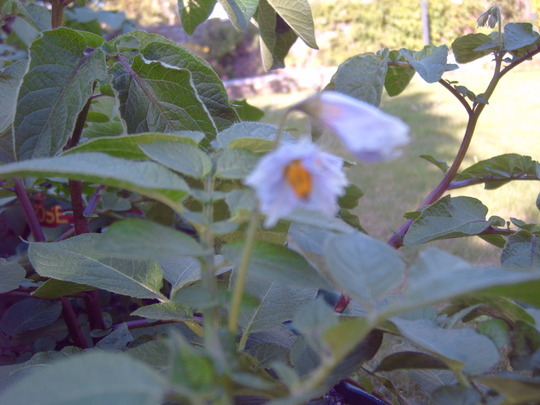 I love potatoes and I love growing them. I mostly grow heritage varieties but I also like to try new varieties. 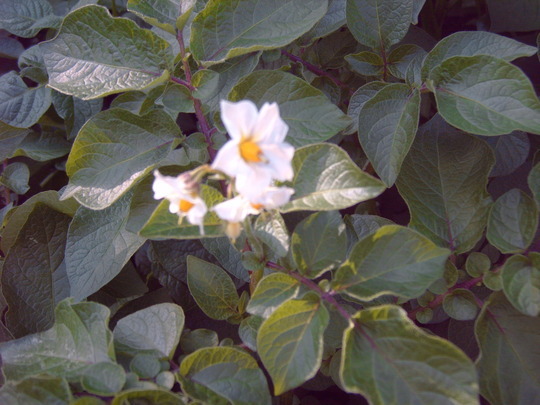 Someone asked me a question about lack of flowers on their kestrel potatoes recently and I did not know the answer but it made me realise how attractive and different the flowers can be on the ones I grow, so I decided to write a blog about them. I also include a photo of the first harvest of the year. 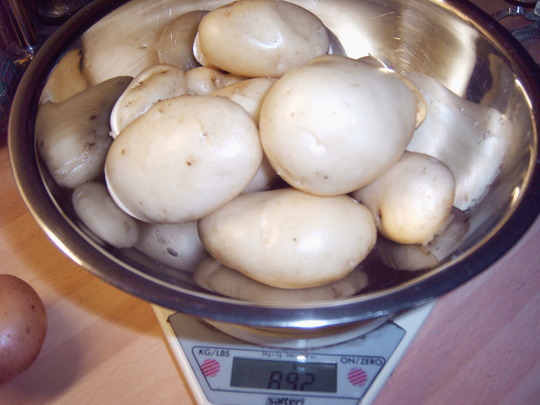 Looking at the log I did when planting I am 2 weeks earlier than the ETA for this variety but who can resist the temptation of new potatoes, straight from the garden to the pot. I will add to the blog over the next few months as I find new flowers and harvest my crop. 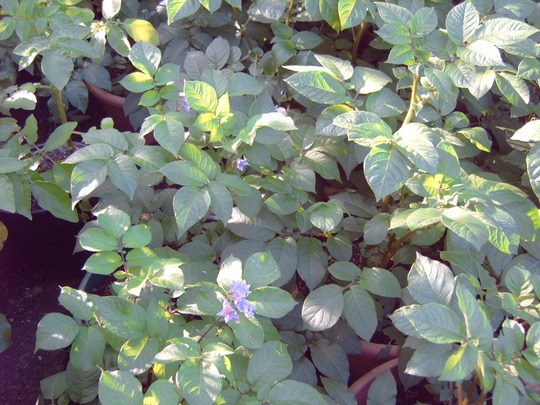 My Potato plot in 2011 is actually made up of different size pots placed mostly in a bed I dug up which originally housed perennials. It had become overgrown with bishop weed and Convolulous. It had a membrane between the plants but over the 20 years since it was first established that had become matted with roots. i decided a total makeover was necessary.The potatoes are grown in a mixture of the soil from the plot and some new bought in compost as well as some of my own home made compost. . These are the first of the International Kidney ( Jersey Royals when grown in Jersey). 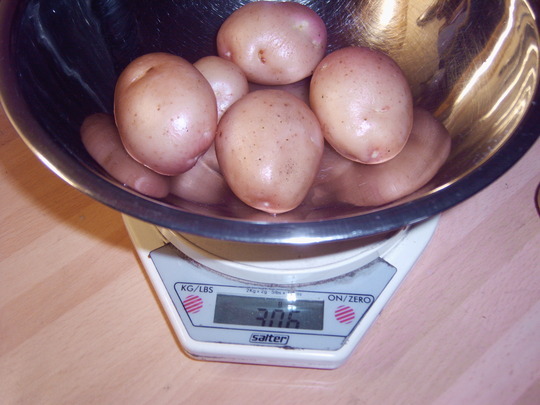 Not bad from 2 little seed potatoes which cost me 8p each. 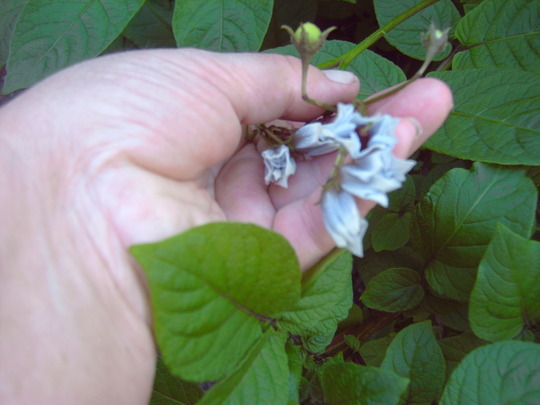 Blue Danube Flowers on red stems. I have updated this with an ETA and the date and weight harvested. As you can see I fell at the first hurdle. Unsure what I wanted to know I had put in a column for when the potato shaws came through the ground and then did not fill it in as I was too busy. I dk that I would want to know that anyway. 18 7 11 We have been enjoying our International Kidney. I am much happier with the result this time. I intend to keep some of the pots of these and use them as late potatoes because that is what they are. 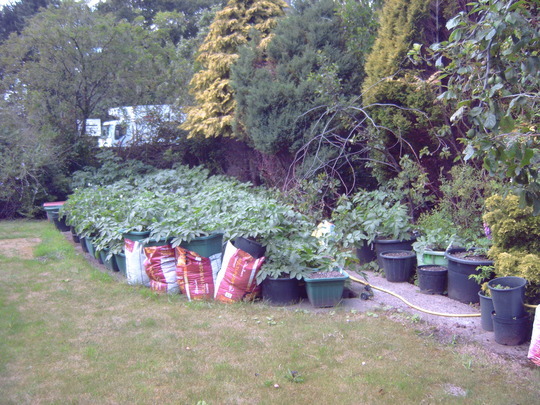 Already there is the promise of baking potatoes as some of them are growing quite big. 18 7 11 from one seed potato grown in a 10L pot I cannot complain about this yield from Vanessa. There was also a problem of watering with this variety as they were under the shade of a tree and did not get the benefit of enough of the rain we have had. I have grown International Kidney and Charlotte and Kestral none have flowers yet. All are grown in the same way as yours. I also grew "Homeguard" a wartime favourite. 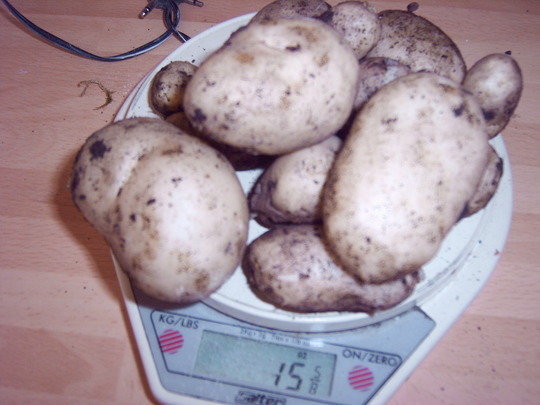 We have eaten them, although small salad potatoes they were very tasty, so I shall grow them again next year. Awaiting the next crop, but having to sit on my hands to stop me pulling them too early. Also, I have "Harmony" from Asda in bags, these are baking potatoes so will have to wait a little longer. Currently looking for seed potatoes for planting in time for Xmas. This year has been an experiment for me as far as growing veg in pots goes, we are awaiting allocation of a council allotment - current waiting time 2yrs. You really cannot beat the taste of freshly pulled spuds, salad and veg. It makes you want eat five portions a day. Looking lovely Scots. you will certainly have a wonderful crop before long! this is an awsome blog Scotts! You've put my wee tatty's to shame hehehe, one day i hope to get as good as you tho! I was saying to Chrissue that i should really keep a diary of what i'm planting, when and how it progresses so i can learn from my mistakes, this year my onion's are fab but my beetroot is a booo and i'm not sure why? Best thing to do is just try again! I just planted more beetroot seeds last week and they're up already so i'll be putting them into their big home this weekend. Good luck with your onions if you try again. You did very well with your first batch of potatoes Claire. I have lots of bags of potatoes but whether there is anything in them we will wait and see. It has been very cold and wet - not good for potatoes really. I think it is too late to plant more sets even if I could get them because they need more time than I think will be available. I am very busy still, upgrading the back garden, so I guess I will just have a holiday from them this year. If I had left these for even another 2 weeks the crop would probably have been better but i'm not complaining and the figures add up when compared to shop bought veg. and the taste is infinitely better. Still time to plant some for Christmas Gee. I discovered a couple of potatoes in the garden shed and they have grown 12" stong shoots I might plant them and see what happens. I enjoy picking potatoes from the garden. I have grown them in big pots for the past few years, but haven't sewn any this year. I'm keeping my fingers crossed Hywel. I like the new avatar. I saw Charlotte and Carlingford seed potatoes in the GC on Wednesday Gee. They keep the seed cool so they don't sprout until August when it is time to plant for Christmas ones. I used to dig my new potatoes about now and bury some in a tin box until Christmas. That worked to get the new potatoes on time and in good condition. Nowadays I buy in Maris Piper because I think they make the best roasters and every farmer grows them for the supermarkets. 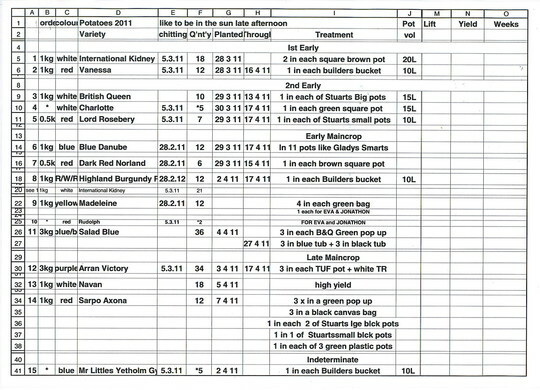 Claire I'm trying to be very organised this year and made up an Excel spreadsheet to keep tabs on all my potatoes and what happens to them. It will be a miracle if I can keep up the regime but I thought i would like to give it a go. I CR if I showed it in a previous blog I'll check. I had not done so but I have put it up now. I also added a column for cost per seed potato. If I have time I will add that later. I'm a bit busy as OH has a poisoned foot and leg. He is supposed to sit with his leg up as much as possible which is almost impossible for an active person like him. I have to ensure he does it. At the moment he is killing himself laughing at a book I bought him yesterday. Its in broad Glasgow vernacular and the humour is priceless. I see you managed to get the chart up! Alas i will have to look when i get home as it is teeny tiny on this phone screen lol. Sending quick recovery happy thoughts to OH, it's not good being stuck in a chair for too long, my dad had a similar problem when he had olsers on his legs before the Dr's fixed his heart, he was there for abowt 18months, never had seen him so sad, we got him a model boat to make n keep him busy now it's half done in the office lol because as you saw in my pic's he's back into the swing of things now, still has to wear funny sock's tho lol. Thank you Claire. He was so restless we went out to Stirling for lunch at Dobbies and had a fish tea in the Kincardine cafe. He was sitting most of the time and he loves getting out and seeing the hills. Puts a bit of colour back in his cheeks. My recycled chimney stones rockery with some help from my GOY friends.